Commercial Printing Services in Gates, NY - Serving Rochester and Beyond for Over 120 Years! Our current facility at 72 Marway Circle (off Buffalo Road) in Gates, NY offers 13,000 square feet of operating room to accommodate the volume and diversification needed for a convenient one-stop experience for all your printing needs. 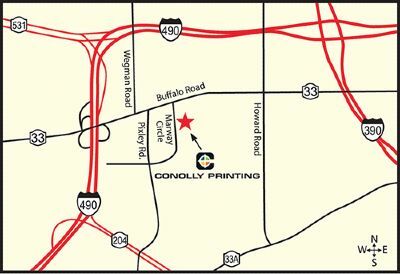 Conolly Printing was formed in Rochester, NY in 1896 and incorporated in 1906, making us one of New York State’s longest-running printing firms. Our ability to embrace ever-changing technology and enhance the customer experience year after year has made us the perfect choice for all your printing needs. Our convenient location offers ample parking and no downtown traffic to navigate for a stress-free visit. Conolly Printing is comprised of a team of talented experts who are dedicated to serving you every step of the way. Led by owner Robert Conolly, our sales representatives work hard to ensure that your ideas are brought to fruition in the most efficient manner possible. Our talented graphics team includes award-winning designers who will help translate your ideas into a product that will impress. Once your design is ready to print, our technical experts and skilled pressmen produce the job with a polished and professional result. We also house our own bindery department to add all the finishing touches to your printed masterpiece. We work as a team, communicating with each other to ensure that we are producing the very best results for you. Our love of collaboration inspires us to keep raising the bar as trends and technologies advance. Conolly Printing is truly unique in the cooperative spirit and skill level of our team. We're happy when we've made you happy! Contact us today. We look forward to working with you! "Conolly Printing has met our business and personal printing needs for over two years. Bob and his staff listen, evaluate and then follow-up in a timely manner. The customer service is professional and caring and the product always first class."